Tag Archive | "Roland Garros"
In 2002, Pete Sampras capped his illustrious career by claiming his 14th major at the U.S. Open, a number which seemed insurmountable for future generation at the time. Today, Novak Djokovic downed Juan Martin Del Potro 6-3, 7-6, 6-3 to hoist the U.S. Open trophy, tying Sampras’ record. What was suppose to be a routine seventh service game for Del Potro, up 40-0, turned into a nightmare as Djokovic induced a series of miscues to seize the break. Quickly, with an uneventful hold, the Serb sealed the first set. On the surface, it was a straight sets victory. However, the match was anything but straightforward. After Djokovic broke in the opening game of the second set, Del Potro returned the favor in the fifth game. Up 4-3, the Argentine could not penetrate Djokovic’s formidable defense. Consequently, the Serb dismissed three break points in an eighth game which lasted 20 minutes. The set was decided by a tiebreaker. After the initial three points went against the server, Del Potro finally gained a 3-1 advantage with a forehand down the line winner. Yet, with the same stroke misfiring, the players were back on serve. With two consecutive errors on serve, Del Potro went down 4-5. As the Argentine’s forehand, his most ominous weapon, deserted him, a 95 minutes set terminated with Del Potro netting a crosscourt forehand. Again it was Djokovic pocketing the early break for 3-1 in the third set. Still, Del Potro clawed his way back and ultimately levelled the score. Djokovic’s steady play put an end to Del Potro’s two game streak and the Serb moved ahead 4-3. Promptly with a forehand flub and a double fault, Del Potro stared at double break point. As the Argentine’s backhand sailed wide, Djokovic secured the 5-3 lead. Soon, a forehand down the line winner gave Djokovic match point. It was all the Serb needed as he struck an overhead winner to conclude the set and nab his third championship after 3 hours and 15 minutes. A chant broke out from his horde of fans as the 2018 finalist stepped up to the mic during the trophy ceremony. Del Potro cited “it’s not easy to speak right now, but I love you too guys. I’m so happy to be playing the final against this magnificent idol. He is one of my friends on tour, he knows if there is one player I want to watch winning title is him. Of course, I’m sad because I [loss], but I’m happy for Novak and his team as well. You deserve to win”. For Del Potro, the 2009 U.S. Open titlist and world number three, it’s been a long journey to his second major final. With multiple wrist surgeries, there was doubt that he would ever return to this caliber of tennis. He expressed “I never gave up. . . I was trying to fix all my injuries to be back here, I got it after nine years which is amazing to me because the U.S. Open is my favorite tournament on tour and I am very proud for that”. Always one to look at the glass more than half full, Del Potro conveyed in Spanish “I want to thank my team, all those who have helped me to get to this stage, my friends, all the people who have supported me. Even from those in Argentina, I could feel the energy. Lastly, I believe at times one can win or lose a tournament, but the love of the people is worth as much as this trophy. I already have this trophy, so I’ll take away with me the love from all of you”. What does this title signify for Djokovic, equaling Sampras’ feat, third on the all time list “I was hoping he was going to be here tonight, Pete you are my idol and I love you”. Moreover, Djokovic stated “I want to congratulate Juan Martin for what he has done, coming back last five years, having faith and belief in himself that one day he will be a top player. I wish him all the best. I know he is going to be here again with the champion trophy”. With Nadal retiring in the semifinals with a knee injury after being down 2 sets to Del Potro, his future is uncertain. Thus, with this win, Djokovic gains traction, moving from a ranking of six to top three. As such, he has a realistic shot at ending as the year end number one. At the French Open, there is no doubt who reigns supreme. With a 6-3, 6-2, 6-3 victory over countryman David Ferrer, Rafael Nadal pocketed his eighth title at Roland Garros becoming the first man in history to capture the same major that many times. In route to his maiden major final, 31 year old Ferrer dispatched all comers in three sets. The world number five even thumped hometown favorite Jo-Wilfried Tsonga in the semifinals after the latter dismissed Roger Federer. To the contrary, Nadal needed 4 hours and 37 minutes to overcome world number one Novak Djokovic in the semifinals in a five set thriller where Djokovic led 4-2 in the last set. The first final since 2004 to feature two men from the same nation, when Gaston Gaudio tussled with fellow Argentine Guillermo Coria, debuted promisingly with Ferrer opening the proceedings with a love hold. In the battle between the top two players in the Open Era, number two has bested number one, seven out of eleven times. Moreover, in the last twenty years, the world number one has conquered Roland Garros only twice. Consequently, Maria Sharapova could have taken solace from those statistics. However, the defending champion had Serena Williams across the net. Williams prevailed 6-4, 6-4 to capture her second title in Paris and her 16th major overall. A staggering twelve successive losses, a nine year drought was the ghost that Sharapova was attempting to banish against Williams who made no secret of her hunger to hoist the Coupe Suzanne Lenglen. Since Serena defeated sister Venus in the 2002 final, no American had advanced to the ultimate match in eleven years. From the first game, Sharapova demonstrated despite a 2-13 record against her rival, she was not willing to gift wrap her title. The Russian overcame love-40 and saved a fourth break point to hold. Sharapova then took advantage of errors from Williams to bank a break for 2-0. But, Sharapova’s lead was short-lived. Soon, with an overhead winner, Williams got the set back on serve. Later, in the fifth game, with Sharapova flubbing a forehand, Williams sealed the break for a 3-2 edge. Despite being tested, Williams consolidated for 4-2. With Sharapova capitalizing on miscues by her opponent in the eighth game, the first set was leveled at 4 all. Once again though, Williams turned up the screws, forcing Sharapova to muff a backhand up the line for double break point. Promptly with a forehand crosscourt winner, Williams moved ahead 5-4. The world number one comfortably guarded serve to pocket the opening set. Serena Williams repelled Maria Sharapova 4-6, 6-3, 6-0 to win her sixth trophy at the Sony Open surpassing Steffi Graff with whom she was previously tied. Williams had already made Sony Open history in the semifinals with the most victories on the women side, 60. Now, she wanted to stand in a league of her own by also capturing the trophy. But, it was Sharapova in search of her first Sony Open crown, after failing four previous times, who handled the breezy conditions and the bright sun well early on. Subsequent to wasting three break point chances in a marathon eleven minute game, Sharapova fabricated a fourth in the fifth service game. On that occasion when Williams’ backhand found the net, Sharapova converted the break for 3-2. However, the world number one applied the necessary pressure to bank the next game and square the set at 3 all. Williams was not at her best on serve, frequently catching her toss and shading her eyes. In the ninth game, Williams double faulted to gift Sharapova a break point. When on the following point Williams dumped a forehand crosscourt into the net, Sharapova was in front 5-4. With a love game replete with miscues by Williams, Sharapova sealed the first set. At that point, a visibly annoyed Williams slammed her racket against her chair, her wakeup call. With an ace, Williams capped a love hold to start the second set. Then, by pushing Sharapova around, she got the break for 2-0. Yet, a bevy of mistakes by Williams led to an ephemeral lead as Sharapova fabricated triple break point. As Williams fumbled another forehand, the players were back on serve. Later, Sharapova set up triple break point once more with a backhand winner. By winning the fifth game, at 3-2, Sharapova was three holds from grabbing the elusive title and completing the rare feat of hoisting both the Indian Wells and Miami trophies. It has only been accomplished three times, last by Kim Clijsters in 2005. Again though, Williams found the emergency brake. With two consecutive winners and a stellar return, Williams was at triple break point. As Sharapova’s stroke kissed the net’s bottom, the second set was leveled at 3 all. Later courtesy of a double fault, Williams had a break point. She took a 5-3 lead when Sharapova committed another forehand error. Williams closed out the second set with an ace. The decisive set became a nightmare for Sharapova. In the opening game, the world number two could not stave off double break point. Subsequent to Williams consolidating for 2-0, Sharapova threw in two successive double faults to provide her rival with an insurance break. Williams pushed the cruise control button, capitalizing on a seventh break point to make it 100% conversion for the match and 5-0. Williams went on a ten game in a row tear to close out the championship. -4. I was up 40-15 and Love-30 in the next game. . . those are the games that you really need to keep challenging out there and keep being in them. . .those are the chances that you will have to take . . .if you want to win the match”. Despite her heavy schedule up to this point, Sharapova cited fatigue was not a factor “ I feel fine. I’m very happy, very fortunate that I’ve been able to play. . . I have had a really great month and I think I can only take positives out of it, really”. Clay is the next stop for the women’s tour. As the defending French Open champion, Sharapova is looking forward to Paris “when you experience such a nice moment in your career, to be able to come back there and to play on that court again where you lifted the trophy, it’s always special and meaningful. Especially for the amount of years that you’ve worked so hard to get to that point. I’ll treat it as any other title that maybe I haven’t won and really want to win because I would love to win it again”. For the match, Williams’ first serve percentage was 51. She fired 35 winners and 32 unforced errors and was behind 4-6, 2-3. Sharapova connected on 64% of her first serves, struck 13 winners and 23 unforced errors. The statistics explain Williams’ surprise in pulling off the victory “I honestly can’t say right now [how I turned it around]. I just feel everything was going so fast. . . I was just making so many errors. I just was like, Serena, are you really going to get to the final and not play up to your potential? I don’t think I had enough energy. I think I may have done too much work yesterday, may have hit too long, done too much gym”. Williams’ strategy to get back into the match “at one point, I was just like, conserve your energy and try and relax and play better”. The serve was not a weapon today. Williams was hitting the first ball at times at 79 mph “I honestly have not served great this whole tournament, if you look at the stats. It hasn’t been my best week serving wise. Usually in the later rounds, I’m able to pick it up and do a little better. Unfortunately, I wasn’t able to do that today, so I had to rely on other parts of my game”. Williams has eyed that sixth trophy since 2009 when she lost to Victoria Azarenka in the final. This week, she even biked to the tournament to assure she would make her third round match. Now, Williams will shift her focus to the clay in search of a companion for her lonely 2008 French Open trophy, the only major she possesses just one of. Clay is perhaps Williams’ most challenging surface. But, she does not view it as such “I think it’s only as hard as you say it is. I happen to love Roland Garros and I’m happy to play there. Hopefully I can just take it one match at a time. That’s in the future. I’m just going to do it one step at a time”. Today’s performance by Williams qualifies as “winning ugly”. If on her worst day, Williams can walk away with the Sony Open, her 16th major, a second French Open may not be far behind. The fight to be king of the mountain will be settled at the All England Club. After a brilliant 2011 season, defending champion Novak Djokovic is under menace from Rafael Nadal and Roger Federer who are vying to strip away the Serb’s number one ranking. The Wimbledon draw has been released and for these three rivals, the path to the summit is a winding one. For the second straight major, Djokovic and Federer are destined to clash in the semifinals. Djokovic has bested the Swiss six of the last seven times they’ve met. As such, Federer will need to conquer his mental demons if he hopes to get to the final. Roger Federer learned the lesson in 2006 and again in 2007. Today, it was Novak Djokovic’s turn. With clay virtuoso Rafael Nadal around to dream of a calendar grand slam or owning all four majors at once is pointless. Nadal prevailed 6-4, 6-3, 2-6, 7-5 over Djokovic to earn his 11th major and a record seventh French Open trophy. Regardless of the outcome, history would be made at Roland Garros. World number one Djokovic was vying to be the third player in three years to attain the career grand slam and the first since Rod Laver to hold all four majors simultaneously. For his part, Nadal was seeking to surpass Bjorn Borg and become the winningest male. Eight years after clenching her first major quarterfinal, ironically at Roland Garros, Maria Sharapova can finally call herself French Open champion. Sharapova dispatched Sara Errani, a surprise finalist, 6-3, 6-2 to obtain the career grand slam. Twice a semifinalist in 2007 and 2011, Sharapova now had a golden shot at grabbing the ultimate prize. While this was the third consecutive year that an Italian woman was battling for the title in Paris, for Errani ranked 24th in the world, this was her maiden major final appearance. Experience was certainly key at the start of the match as Sharapova broke on a backhand miscue by Errani to race to a 2-0 advantage. Subsequent to consolidating, Sharapova struck a backhand winner for a double break edge. Aided by two double faults from her opponent, Errani secured her first game and held to narrow the deficit to 2-4. Yet promptly, with a love game, Sharapova extended her lead to 5-2. After Errani fought off double set point to guard serve, Sharapova connected on her third set point with backhand down the line winner. By carrying the opening set 6-3, Sharapova had one hand on the French Open trophy. The second set unfolded similarly to the initial one with Sharapova breaking Errani at love to capture the early break. But, Errani overcame the effect of being a first time finalist at a major and tried to claw her way back. Despite the Italian’s defiance, Sharapova went ahead 2-0. Subsequent to a difficult game, with Sharapova’s backhand sailing long, Errani had a break point. But, Sharapova would not be denied and maintained serve for 3-1. Despite a persistent drizzle, spectators stayed glued to their seats at the Foro Italico. In the final of the Internazionali BNL D’Italia defending champion Maria Sharapova roared back from a 4-6, 0-4 hole to vanquish Na Li 4-6, 6-4, 7-6. In the first set, Sharapova got the initial break to go up 2-1. However, Li quickly captured the next game to get back on serve. With Sharapova serving at 4-5, some critical service miscues allowed Li to bag the first set. For the second consecutive day, the French Open became a part of history as Rafael Nadal beat Roger Federer 7-5,7-6,5-7,6-1 to equal Bjorn Borg with six French Open titles. Nadal also became the seventh man in the exclusive club of those with 10 or more major trophies. The last time the two clashed in a final at a major was the 2009 Australian Open. This was the twenty-fifth meeting between Nadal and Federer, their fifth at Roland Garros and their fourth final. In 2008, Nadal blew Federer off the court 6-1,6-3,6-0. After ending Novak Djokovic’s 2011 unbeaten run at 41 matches, Federer came in rejuvenated and relaxed, it was evident in the first set. Subsequent to guarding serve, on a backhand error by Nadal, Federer had double break point. Despite Nadal getting to deuce, on his fourth opportunity, Federer seized the break and consolidated for 3-0. After constructing a 5-2 advantage, as Nadal’s forehand sailed long, Federer had set point. However, with the dropshot missing its mark, Nadal was at deuce and later captured the game. Serving for the initial set, Federer’s first serve which was instrumental in building his lead deserted him. Federer netted a backhand to hand Nadal break point. When the Swiss misfired on a volley after a passing shot, the players were back on serve. From the outset, this year’s French Open title was up for grabs. Still, a final featuring world number five and defending champion Francesca Schiavone and world number six Li Na was a surprise. Today, Li defeated Schiavone 6-4,7-6 to become the first Chinese player to capture a major. With a combined age of over sixty, this was the most mature major women’s final since Wimbledon 1998 whereby Jana Novotna prevailed over Nathalie Tauziat. At 30 years of age, in her first final since her title at Roland Garros, Schiavone was hoping to end her trophy drought by successfully repeating. Since becoming the first Chinese individual to reach a major final, Li fell off the radar. After the Australian Open, the 29 year old failed to advance beyond the second round at any hardcourt event. Ultimately, the clay proved therapeutic with two semifinal showings by Li in Madrid and Rome. 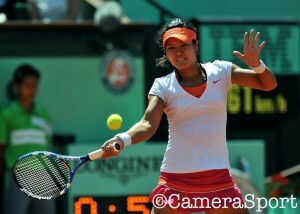 After each woman held her initial two games, with a backhand volley winner, Li had double break point. With Schiavone’s forehand up the line sailing wide, Li pocketed the break. By consolidating with a love game, Li moved ahead 4-2. With Schiavone unable to fabricate a break point, the one game difference was all Li required to seize the first set. There was a serenity about Li which was absent in her first major final. Li had clearly learned from her loss to Kim Clijsters in Melbourne. With sizzling forehands, Li had double digit winners in the first set. Furthermore, early on, it was conspicuous that Schiavone’s use of spin, slice, volley and overall variety were not throwing Li off balance. Instead, it was the Italian who was finding herself on her back heel.